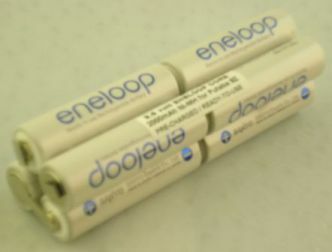 9Z eneloop core: 9.6v PRE-CHARGED NiMH battery core assembly for Futaba transmitters. This goes inside the Futaba NT-8A battery case. This insert arrives to you PRE-CHARGED and READY-TO-USE. Solder tabs are installed on the (+) and (-) ends for easier connecting. Your battery case will need to be unscrewed open, and then this core can be placed inside. Two (2) solder conenctions will link the core to the circuit board inside the black plastic housing. This fits in transmitters such as Futaba 9Z, PCM 1024Z, PCM 1024ZA, PCM 1024ZH, 9ZA, 9ZAP, 9ZH, 9ZAW, 9ZHW, 9ZHWS, 9ZAWII, 9ZHWII, and others. These eneloop cells retain their charge when not in use, and can be re-charged (when needed) with common Ni-MH chargers (slow or fast).